If you have purchased a pattern with a download code, please enter the code below to download your file(s). If you have any trouble, please email Amanda with the details so she can help (amanda at amandamurphydesign dot com). Flourishes, by far!! Congrats on your new collections!! So I can’t download “Starstruck” unless I win it? That’s a little frustrating (I never win anything.). I love your creations and your blog, but now I’m just sad. Starstruck is part of my pattern line and can be found as a PDF under the “my store” tab at the top of the page. It isn’t a free pattern like the patterns listed on this page. I hope this helps. Be sure to check your spam folder as it will come automatically and could be treated as spam since it has an attachment. Thanks for the tutorial on the towels. I think that the edgestitch foot for the Bernina is 10. #38 is a piping foot. I purchased your Sewing Room Sampler pattern from the Berry Patch in Fort Worth, and I cannot find the download code anywhere to download the other files available such as the sewing machine cover. Please let me know the code so I can download the projects. They are really cute! Hi Sharon! There is no code for these patterns. They are just finishing instructions and they are free. They are listed in the bullet points on this page and you can just click on the link. They are separated into Months 1-3 and 4-6. 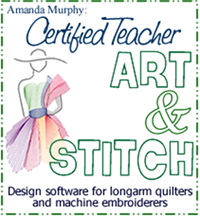 You only need download codes for my patterns with SVG files or other digital files. Not the free stuff. I took your Ruler Works class at Augusta Sewing Center on Friday, March 17th. We did not finish the sampler and you said the rest of the directions would be e-mailed in a PDF file. I contacted the store, but no luck. Can you send them to me. I really want to finish this sampler so I don’t have it in my UFO pile. Thank you in advance for your help. I contacted them and they should have emailed you. Please let me know if you still don’t have the file. I just discovered your site and would like to know where I can purchase the bejeweled pattern with the yoyo’s on it It is so cute . I just began following you and I’m going to try FMQ. 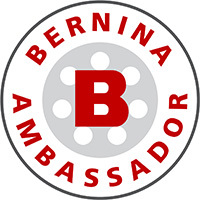 Would you consider Demonstrating the Bernina rulers on a video. I know you have classes and will watch for them as we begin traveling, and I’m sure there are many who would purchase a video or two on the rulers, those who can’t get to your teaching. This is something I would consider and would hope to be filing more in the future. This is the busiest time of year for me prepping projects for both Spring Quilt Market and BU. But it is something I’d like to do in the future. I just completed piecing your Stairways quilt top from “Make Precut Quilts” I found that the number indicated for cutting the 4 1/2″ x 2 1/2″ background pieces was incorrect in the cutting directions. The quilt requires 52 of these pieces and it says to only cut 48. Thanks Margorie! I’ll let C&T know. provide you his/her vacuum cleaner for a short duration. The evaporator and condenser coils may be cleaned up with a vacuum. What is the emphasis going to be on during your Sept 28-30, class at Nuttall’s in SLC? We are going to be doing three days on longarms, concentrating on free-motion, rulerwork, and automation. Should be fun! Thanks for the download for towels Going to inbox to check it out. Hello Amanda: I purchased Meadows minis design. Can’t download it. It’s not in email nor spam. Do I need a code? Thanks. No you don’t. I just manually sent it to you so please let me know if you don’t receive it. Hello. The pattern instructions for Flicker… On the cutting instructions, after you cut the binding strips, you have what I think to be another repeat end of sentence of the focus fabric cutting. Just FYI. Where do I find the pattern for the anniversary quilt that has the corrections. Thank you so much for the free pattern downloads. You are so kind.